The ‘Alignment’ is the process which will lead to a core, single, ASC Farm Standard. It aims to provide a higher level of consistency and harmonise the applicability, criteria & requirements across all farmed seafood species currently targeted by ASC. The Alignment constitutes an important milestone in ASC’s mission to help transform the industry towards more sustainable and responsible aquaculture. The process of Alignment is necessary in order to improve consistency and efficiency of our standards. It aims to deliver a higher level of homogeneity and rationalisation across the current standards, provide greater clarity to farmers, auditors and to other external stakeholders. This alignment will allow the ASC to expand its reach (e.g. production systems, species) and impact in a more effective and efficient manner; it will also facilitate the (e.g. metric-based) revision(s) process. As part of this revision, the Standard will also be updated to capture evolving best social and environmental aquaculture practices and streamlined to ensure a clarified, consistent audit process. The ASC has in 2016 sought stakeholder feedback on the first draft of a proposed Core Standard of indicators. This documented harmonises Principles, Rationale, Criteria and Indicators from the then seven ASC species standards (Salmon, Trout, Pangasius, Tilapia, Shrimp, Bivalves, Abalone); and the (then) draft Seriola/Cobia standard was also considered before its launch in November 2016. Agreeing a common set of indicators was the first step in creating a Core Standard that will lead to harmonisation of ASC’s standards. Following this, a Review of the Alignment process was carried out in 2017. Principle 1 (P1): The UoC operates legally and applies effective business management. Principle 2 (P2): The UoC operates in an environmentally responsible manner. Principle 3 (P3): The UoC operates in a socially responsible manner. The Units of Certification (UoCs) will include various aquaculture production ‘Farm’ systems and some ‘Processing’ level. The ASC Farm Standard will have production-system specific criteria (where needed/applicable) and species-specific metrics (where needed/applicable). ASC is currently considering 8 separate UoCs: 1-Feed Mills; 2-Farm-cage culture; 3-Farm-pond culture; 4-Farm-flow through culture; 5-Farm-recirculation culture (RAS); 6-Farm-Non-fed/Non-fertilised culture; 7-Farm-Non-fed but fertilised culture; 8-Processing Plants. The second draft of the Standard (Public Consultation II [March 14 – May 14, 2019]) is focusing on the ‘Legal’ (P1) and ‘Social’ (P3) principles. This round of public consultation also includes that of revisions to the Certification and Accreditation Requirement (CARv2.2) document, which notably introduces a new Social Auditing Methodology (SAM) including a Social Risk Assessment tool. Species-specific and metric performance levels / requirements will be defined for each indicator, this will be particularly applicable to the (new – ‘Environment’) Principle 2 which will be the focus of another public consultation round (in Q4 2019). All the indicators in the current standards will be transposed in the Farm Standard in accordance with the intent of the previous standards and Dialogues. 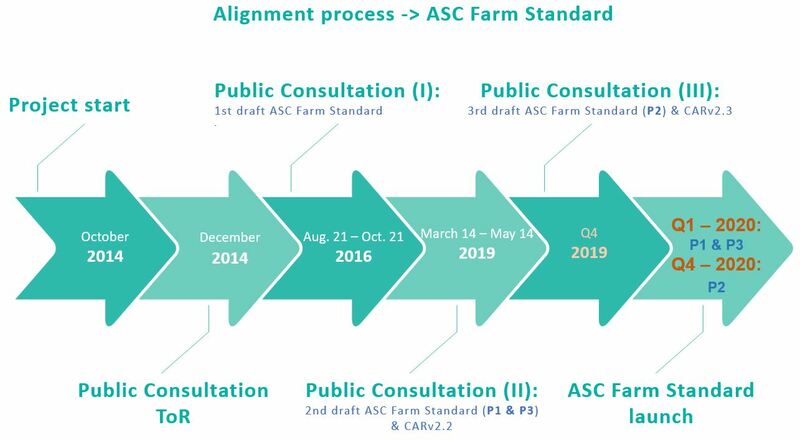 We aim to release P1-P3 in early 2020, and the full ASC Farm Standard (including P2) in late 2020. Dial-in information will be shared upon registration.